Create your most naturally beautiful self. 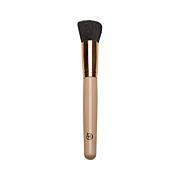 This kabuki brush ensures an even finish for your loose powders and body shimmers. 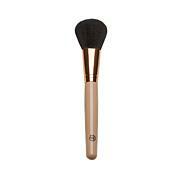 The compact design and gleaming rose goldtone hardware make this brush a perfect addition to your cosmetics collection. Beautiful looks require precise application. When it's time to make your makeup smolder, this is the brush to use. Soft, natural bristles pack on pigment and sweep easily across eyelids for a perfectly finished look. Good to Know Clean with eye makeup remover.